Age-adjustable for the whole family. Because the definition of fever changes with age. Age Precision™ Thermometer with colour-coded display. Clinical research shows the definition of fever changes with age1. Age Precision is optimised for underarm measurement. * ± 0.1ºC between 35.5ºC and 42ºC. **Refers to the shortest reading time achieved in clinical studies. 1 Herzog L, Phillips S, Addressing Concerns About Fever. Braun digital stick thermometers bring you all of the quality, accuracy and innovation of the Braun brand but in a smaller product. 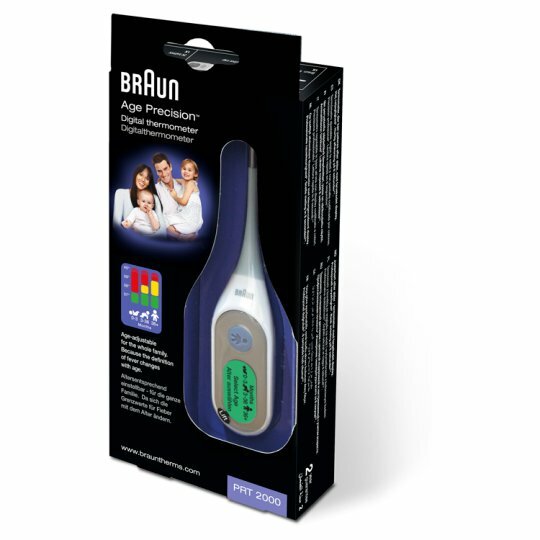 Now with new Age Precision™ technology, this Braun digital stick thermometer helps you interpret your child's temperature even more accurately, based on the age of the child, to give you additional reassurance. It couldn't be easier. Simply select your child's age and the colour coded display will help you understand the temperature reading based on the age of your child. Set your child's age with the Age Precision button. Take the temperature. A reading is taken in 8 seconds and confirmed with a beep. The colour coded display will help you understand and interpret the results and act accordingly - green (normal temperature), yellow (elevated temperature) and red (high temperature). We tell you more about monitoring and interpreting your child's temperature and how our new Age Precision™ technology can help you do this, to take the guesswork out of taking temperature and bring you additional reassurance. We hope you find this information helpful as you learn more about what makes Braun your professional partner when it comes to monitoring your family's body temperature.